Sebaldella termitidis (Sebald 1962) Collins and Shah 1986, is the only species in the genus Sebaldella within the fusobacterial family ‘Leptotrichiaceae’. The sole and type strain of the species was first isolated about 50 years ago from intestinal content of Mediterranean termites. The species is of interest for its very isolated phylogenetic position within the phylum Fusobacteria in the tree of life, with no other species sharing more than 90% 16S rRNA sequence similarity. 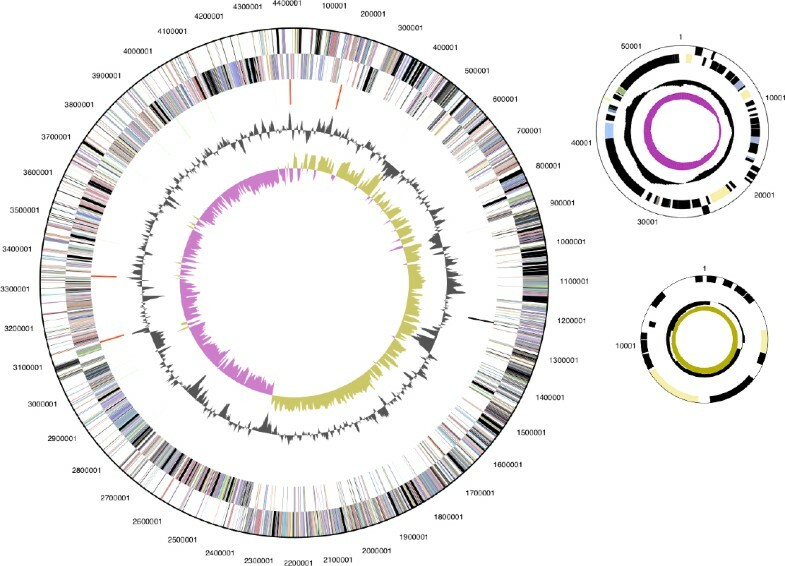 The 4,486,650 bp long genome with its 4,210 protein-coding and 54 RNA genes is part of the Genomic Encyclopedia of Bacteria and Archaea project. Strain NCTC 11300T (= ATCC 33386TM = NCTC 11300) is the type strain of the species Sebaldella termitidis . The strain was first isolated from posterior intestinal content of Reticulitermes lucifugus (Mediterranean termites) by the French microbiologist Madeleine Sebald [1,2], and was initially classified as Bacteroides termitidis . The unusually low G+C content, as well as biochemical features which did not correspond to those known for the other members of the genus Bacteroides , and the subsequently described novel 16S rRNA sequences  made the position of B. termitidis within the genus Bacteroides appear controversial, and guided Collins and Shah in 1986 to reclassify B. termitidis as the type strain of the novel genus Sebaldella . Here we present a summary classification and a set of features for S. termitidis NCTC 11300T, together with the description of the complete genomic sequencing and annotation. NCTC 11300T represents an isolated species, with no other cultivated strain known in the literature belonging to the species. An uncultured clone with identical 16S rRNA sequence was identified in a mesophilic anaerobic digester that treats municipal wastewater sludge in Clos de Hilde, France , and another uncultured clone, PCD-1 (96.1% 16S rRNA sequence identity), was reported from the digestive tract of the ground beetle Poecilus chalcites . The closest related type strains are those of the genus Leptotrichia, which share 85.9 to 89.96% 16S rRNA sequence similarity . Neither environmental screenings nor metagenomic surveys provided any 16S rRNA sequence with significant sequence similarity to NCTC 11300T, indicating that members of the species S. termitidis and the genus Sebaldella are not very frequent in the environment (status February 2010). Figure 1 shows the phylogenetic neighborhood of S. termitidis NCTC 11300T in a 16S rRNA based tree. The sequences of the four identical copies of the 16S rRNA gene in the genome do not differ from the previously published 16S rRNA sequence generated from ATCC 3386 (M58678), which is missing two nucleotides and contains 30 ambiguous base calls. Phylogenetic tree highlighting the position of S. termitidis NCTC 11300T relative to the other type strains within the family ‘Leptotrichiaceae’. The tree was inferred from 1,422 aligned characters [9,10] of the 16S rRNA gene sequence under the maximum likelihood criterion  and rooted in accordance with the current taxonomy. The branches are scaled in terms of the expected number of substitutions per site. Numbers above branches are support values from 1,000 bootstrap replicates if larger than 60%. Lineages with type strain genome sequencing projects registered in GOLD  are shown in blue, published genomes in bold, e.g. 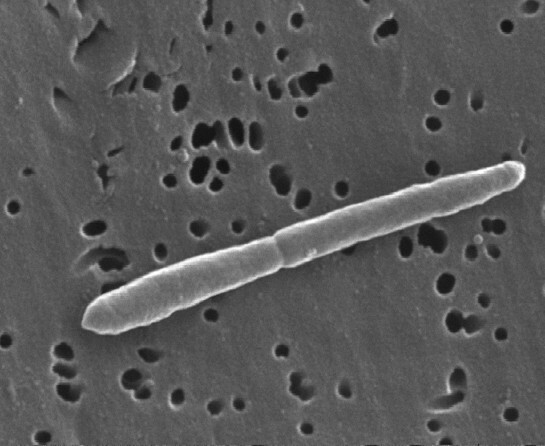 the recently published GEBA genomes from Leptotrichia buccalis , and Streptobacillus moniliformis . Cells of strain NCTC 11300T are Gram-negative, obligately anaerobic, nonmotile, nonspore-forming rods of 0.3 to 0.5 x 2 to 12 µm with central swellings (Figure 2 and Table 1) . Cells occur singly, in pairs, as well as in filaments . Colonies on surface are transparent to opaque, circular measuring 1–2 mm in diameter, whereas colonies in deep agar are non pigmented and lenticular . Scanning electron micrograph of S. termitidis NCTC 11300T. (J. Carr, CDC, Atlanta, Georgia). More EM photos of the organism can be found at http://phil.cdc.gov/phil. The major end products of the glucose metabolism by strain NCTC 11300T are acetic and lactic acids (with some formic acid) as opposed to succinic and acetic acids dominating in members of the genus Bacteroides . Enzymes of the hexose-monophosphate-shunt are missing, while present in members of the genus Bacteroides [1,4]. A list of additional sugars and alcohols used or not-used for fermentation is provided by Collins and Shah . The cell wall structure of strain NCTC 11300T has not yet been reported. Nonhydroxylated and 3-hydroxyated fatty acids were present . The major long chain fatty acids are saturated and monounsaturated straight chain acids: C16:0 (37%) and C18:1 (41%), with methyl branched acids being absent , as opposed to straight-chain saturated, anteiso- and iso-methyl branched-chain acids in members of the genus Bacteroides, which are missing the monounsaturated acids . Menaquinones were not detected, as opposed to members of the genus Bacteroides . S. termitidis NCTC 11300T, ATCC 33386TM, was grown anaerobically in ATCC medium 1490 (Modified chopped meat medium)  at 37°C. DNA was isolated from cell paste using a basic CTAB extraction and then quality controlled according to JGI guidelines. The genome was sequenced using a combination of Sanger and 454 sequencing platforms. All general aspects of library construction and sequencing can be found at http://www.jgi.doe.gov/. 454 Pyrosequencing reads were assembled using the Newbler assembler version 1.1.02.15 (Roche). Large Newbler contigs were broken into 4,966 overlapping fragments of 1,000 bp and entered into assembly as pseudo-reads. The sequences were assigned quality scores based on Newbler consensus q-scores with modifications to account for overlap redundancy and to adjust inflated q-scores. A hybrid 454/Sanger assembly was made using the parallel phrap assembler (High Performance Software, LLC). Possible mis-assemblies were corrected with Dupfinisher  or transposon bombing of bridging clones (Epicentre Biotechnologies, Madison, WI). Gaps between contigs were closed by editing in Consed, custom primer walk or PCR amplification. A total of 796 Sanger finishing reads were produced to close gaps, to resolve repetitive regions, and to raise the quality of the finished sequence. Illumina reads were used to improve the final consensus quality using an in-house developed tool (the Polisher, unpublished). The error rate of the completed genome sequence is less than 1 in 100,000. Together all sequence types provided 39.5× coverage of the genome. The final assembly contains 45,934 Sanger and 760,187 pyrosequence reads. The genome consists of a 4,418,842 bp long chromosome, and two plasmids with 54,160 bp and 13,648 bp length, respectively, with a 33.4% GC content (Table 3 and Figure 3). Of the 4,264 genes predicted, 4,210 were protein-coding genes, and 54 RNAs; 59 pseudogenes were identified. The majority of the protein-coding genes (60.4%) were assigned with a putative function while those remaining were annotated as hypothetical proteins. The distribution of genes into COGs functional categories is presented in Table 4. Graphical circular maps of the chromosome and the two plasmids. From outside to the center: Genes on forward strand (color by COG categories), Genes on reverse strand (color by COG categories), RNA genes (tRNAs green, rRNAs red, other RNAs black), GC content, GC skew.